Background: Acute inflammatory disease is accompanied by stimulation of inflammatory mediators. This, primarily, intends to control the inflammatory stimulus. In some cases, however, cytokine response may be overwhelming and causes an overshooting release of cytokines. This is well known as “cytokine storm” and is known to lead to clinical consequences such as shock, vasoplegia, organ dysfunction and capillary leakage. Cytokine removal by extracorporeal blood purification techniques as an adjunctive therapy is intended to modulate an overshooting inflammatory response and increase the chances for recovery. Zsolt Molnar is head of the department of Anaesthesiology and Intensive Therapy, University of Szeged in Hungary, since 2009. He has published extensively in the area of critical care medicine. His main research interests are: sepsis related haemodynamic changes, fluid therapy, markers of inflammation, and oxygen debt and perioperative intensive care. He has been a regular invited speaker on large international, regional and national conferences all over Europe and overseas as well, with almost 100 lectures over the last 5 years. His total impact factor is >150, with a citation index of >450 at present. He has extensive international relationships, which resulted in several publications and other collaborative works. He is a member of the European Society of Anaesthesiology (ESA) and the European Society of Intensive Care Medicine. He is also a member of the intensive care subcommittee of the ESA. He has been reviewing for most leading journals in intensive care medicine and anesthesiology for several years. He is also the member of the editorial board of several international journals. He has published extensively in critical care Up to 2016, he published 98 manuscripts (43 originals), with a total impact factor of 146, independent citation index of 680 and a Hirsch-index of 17. One of his most important initiatives is the organization of a Central and Eastern European conference, called SepsEast (www.sepseast2016.com). During this symposium the audience will gain insight in the pathophysiological principles and clinical consequences of the dysregulated, hyperinflammatory response hallmark of septic shock and many other, non-infectious systemic hyperinflammatory states. A new, innovating and performant cytokine adsorption technology will be discussed as well as its capacity to modulate the immune response and improve hemodynamics and other clinical outcomes. 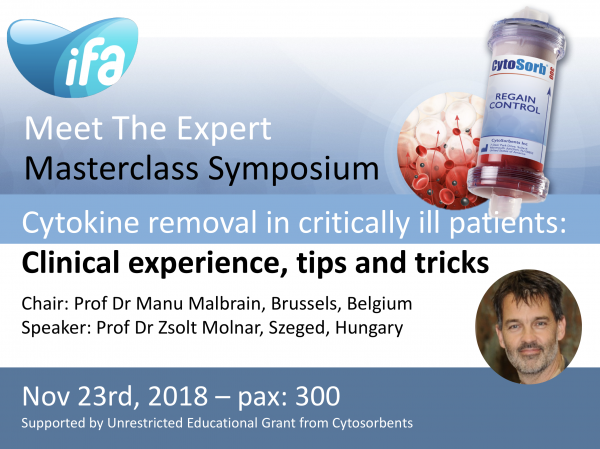 The speaker will share his practical experiences with introducing this technology in clinical routine and will present his current clinical results after more than 50 treatments in various indications. Introduction: In several studies and in vitro data is demonstrated that the additional treatment with an extracorporal cytokine adsorption filter (Cytosorb, Cytosorbents corp.) may be helpful in patients with multiorgan failure due to increased cytokine levels . CytoSorb is used as adjunctive therapy not only in septic multiorgan failure as well as in severe pancreatitis and other critical ill patients and is well tolerated and safe. Methods: We collected data from 14 Patients treated additional with cytokine-haemadsorption filter (Cytosorb) as adjunctive therapy in septic shock or severe SIRS. The focus was abdominal (28.6 %), pneumonia (50 %) and pancreatitis (14.3 %). Aim of our case study was to show the effectiveness of Cytosorb treatment used as adjunctive therapy in critically ill patients. If there was no decrease of catecholamine demand and kidney injury persistent after initial therapy following actual guidelines , Cytosorb therapy was initiated. We collected data before, during and after treatment and calculated demand of norepinephrine (μg/h vs. thereby achieved mm Hg MAP). Conclusions: In this case study the effects we could observe were pronounced decrease in catecholamine demand and blood lactate level. We could see increased survival if treatment with CytoSorb haemadsorption filter started between 24 – 48 h, patients who had a greater delay had poor outcome. Reasons for delay has been late acute renal failure or late admission to ICU. This implicates a therapy start not later than 24 – 48 hours.